Astonishing. There is no other word to describe and catch the essence of this CD. And of this band, Woodstore, that comes to the international scene with a project of utter prestige. They all come from Sardinia, one of the most beautiful region of the Mediterranean. Sardinia is an island with strongly rooted cultural, artistic and musical traditions. However, Woodstore players, rather than hide in the cosy microcosm of their land, have always sought to find a universal language able to connect with their surroundings and beyond. They have established deep conceptual bonds with that global aesthetic poetry we call jazz. 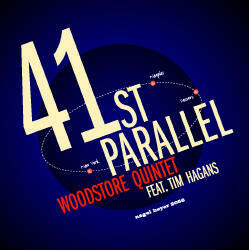 Woodstore - named after the band’s first place rehearsal where this project came to life - represents a fresh new moment in the international jazz landscape. Woodstore’s trade marks are the wide range of musical linguistic abilities, the talent and care of the narrative plot, the articulation and timely exchange between written and improvised notes, the emotional contrast between the ability to sing the themes and their complex harmonic progressions, the lively improvised contributions, the solid and interlinked texture of the ensemble (a truly small miracle of polyphonic equilibrium), the ability to alternate the main musical body with chromatic background landscape, the infallible architectonic structure of the compositions. This is an open project that looks constantly for an inner dialogue and links with other "voices" and other ideas. The core team includes: Mariano Tedde, who wrote all the music and plays the piano with crystalline touch. He is formidable in comping, now a rare thing in jazz. Massimo Carboni, the tenor saxophone player with ultra modern phrasing, has a round and warm sound. His approach is reminiscent of Mike Brecker but differs from any other model for his extraordinary use of silence. Paolo Spanu is an agile and infallible time keeper. Gianni Filindeu is an anthological and futuristic drummer, whose style whisks and swirls seamlessly decades of drums history, resulting in a highly original, personal style. This group has an open configuration; around its core group Woodstore builds various combinations of its music, accepting the challenges from guest artists with different backgrounds. For example Tim Hagans with his boundless trumpet playing, adds a portion of the high pitch range to the whole sound. Hagans brings his cross-cutting knowledge to the musical discourse as well as the depth of melodic resolutions and the edges and corners of unforeseeable solo-ism. The vocalist extraordinaire Maria Pia De Vito brings up the highly melodic evocative profiles of a mature, accomplished, original, unexpected project. Astonishing, indeed. When I listen to music, I know that I like it when two things happen. One, that it will make me want to play and, two, that it will make me want to hear it again. This record does both. It makes me feel like I would enjoy playing the set of music with the band and it makes me want to listen to it again; to try to figure out what was going on....I hope that it touches me intellectually and spiritually. The music and the musicians on this recording pay respect to the tradition without being derivative. I go back with Tim a long way. He was the first guy I heard play live when I moved to NY. I remember thinking to myself "these guys are serious over here". When I listen to him play, I hear the history of the trumpet interpreted through a highly individual voice. It’s always exciting and inspiring and the rest of the band rises to the occasion. The music is inspired and inspiring.